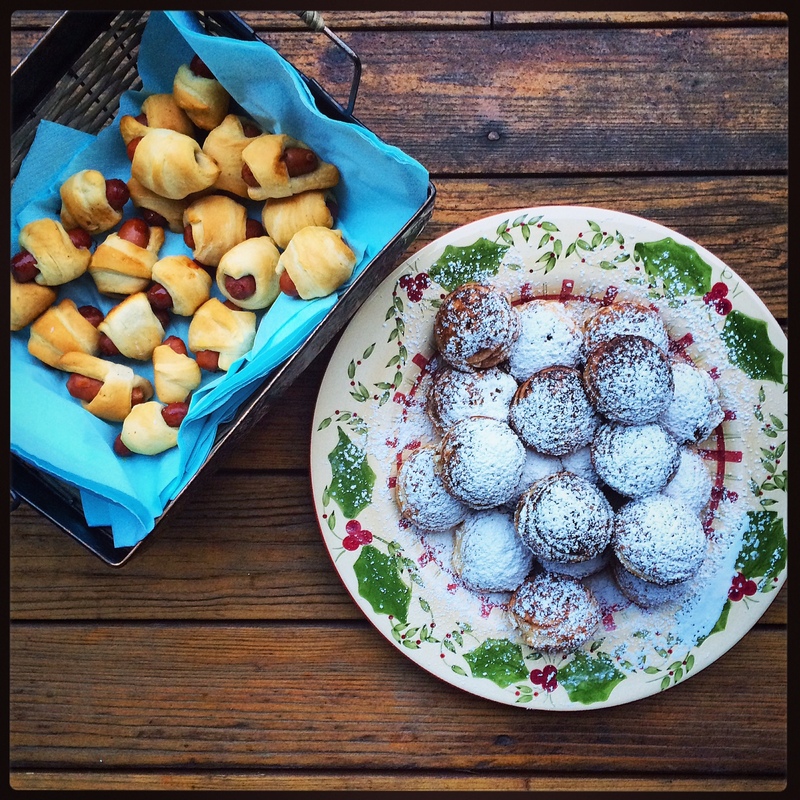 Christmas Breakfast 2014 may be my favorite yet – Lil’ Crescent Smokies and Spiced Apple Ebelskivers. We were able to whip these up pretty fast and eat everything WHILE opening presents…because we just love to multitask THAT much! The Lil’ Crescent Smokies are one of the best Christmas breakfast traditions that Jordan has introduced my family to…they are just so easy and so satisfying! For Ebelskivers, you have to have a special Ebelskiver pan, but the recipe below isn’t too difficult to bust out on Christmas day, since we made the apple filling the day before. I know I am past the Christmas due date…but you can totally eat this breakfast whenever you want. In a large bowl, whisk together the flour, sugar, baking powder, and salt. In a small bowl, lightly whisk the egg yolks, then whisk in the milk, melted butter, and vanilla. Add the yolk mixture to the flour mixture and, using a wooden spoon, stir until well blended. The batter will be slightly lumpy. In a clean bowl, using an electric mixer on high speed, beat the egg whites until stiff, but not dry, peaks form. Using a rubber spatula, fold about one third of the egg whites into the batter to lighten it, then fold in the rest just until no white streaks remain. Use the batter right away. In a saucepan, melt the butter over medium-high heat. Add the sugar, cinnamon, nutmeg, and salt and cook, stirring to dissolve the sugar, just until bubble, 3-5 minutes. Add the apples, reduce the heat to medium, and cook, stirring often, until the apples are tender, about 10 minutes. Remove from the heat and set aside. Preheat the oven to 200F. Brush the wells of an ebelskiver pan pan with some melted butter and place over medium heat. When the butter starts to bubble, add about 1 tablespoon of batter to each well. Working quickly, carefully spoon about 1 teaspoon of the apple filling into the center of each pancake. Top each with another 1 tablespoon batter. Cook until the bottoms of the pancakes are lightly browned and crisp, 3-5 minutes. Use 2 short wooden skewers to turn all the pancakes and cook until lightly browned on the second side, about 3 minutes longer. Transfer the finished pancakes to a platter and keep warm in the oven while you repeat to make 2 more batches. Dust the warm ebelskivers with powdered sugar and serve. These are great immediately, but we find the flavor of the apples comes out even more after the pancakes have cooled down, A cooled down ebelskiver dipped in hot maple syrup is really quite the party in your mouth!